Windows customization has come a long way since it first started to become popular many, many years ago. It has also changed significantly during that time, with different apps coming and going throughout the years. Even though some styles and techniques have changed, there is a still a want and need to customize the Windows desktop to fit your own personal style. There are many ways to get this done, but today I wanted to write up a quick intro guide for new users who want to get started with the basics. I’m going to show you the apps you need to get started with customizing your desktop quickly and easily. WindowBlinds is the best way to change the theme of your Windows user interface to one of thousands that are available on sites like WinCustomize. These skins can be customized further by changing the color, transparency, and texture to fit your style. 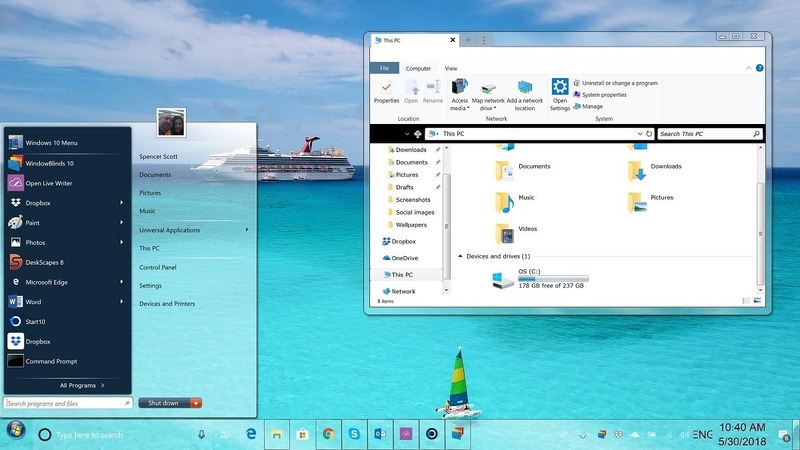 If you're a Windows 10 user, then using Start10 along with WindowBlinds will also give you the ability to change the Start menu to match the rest of the skin to complete your new look. DeskScapes lets you have cool animated wallpapers instead of normal static wallpapers. It features over 40 special effects that can be applied to wallpapers to customize them even further. You can apply your images and videos to the desktop wallpaper and can use any animated wallpaper as your PC screensaver. Changing your Windows cursor with CursorFX is a great place to start with Windows customization. It’s very simple to do and there are many cursor themes available to download. You can really change your desktop by having a cool cursor on your desktop all day.